TEAM Rapid is a plastic injection molding manufacturer in China, we produce thousands of plastic injection molded parts each day in various sizes and geometries. The process involves a high pressure injection of a polymer into a mould where it is shaped. 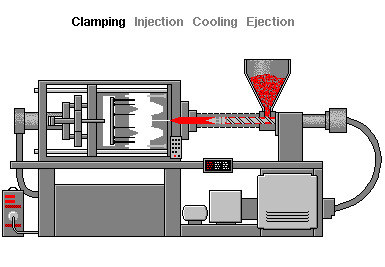 Clamping, injection, cooling and ejections are the main four stages in the cycle. Depending on how large the mold is and the efficiency of the injection machine, the injection cycle usually lasts on 2 seconds to 2 minutes. We outline the process here, so you can have a better idea of how TEAM Rapid produces your plastic injection molded parts. Injection Mold is designed to 2 halves, both halves are attached to injection molding machine and pressed together using a hydraulic clamp during the injection and cooling, the mold will be opened once the plastic workpiece has been filled fully. This is the stage when raw plastic pellets are fed from a funnel-shaped hopper into the injection molding machine. Once in the machine, an auger screw pushes the pellets through a barrel where the plastic is heated and injected from the nozzle into the mold quickly and with high pressure. Under the pressure caused by barrel, as much as plastic will be packed into the mold in a short time. The cooling stage starts once the molten plastic hits the mold. The plastic cools and harden into the desired shape of the cavity. The mold will be closed during the cooling stage, and part takes amount of time for fully cool vary from the part’s size and layout of cooling channels. The mold opens again after cooling, and the part is ejected out. Force must be used because the part shrinks and sticks to the mould. The mould can be shut again after ejection and another shot can be injected for the process to begin again. If you would like to know more about Rapid Injection Molding or your company are looking for rapid prototyping services china and injection molding services, give us a call at +86 760 8850 8730 or email sales@teamrapidtooling.com .